Update: The New York Times announced on January 20 that they will indeed begin to meter content, starting in 2011. Read the Times’ statement here. Bloggers’ reactions? Mashable predicts that the number of sites linking to the Times will decrease, negatively impacting traffic, while most readers will move on to another news source after they reach their limit. TechCrunch breaks down the numbers and comes to a skeptical, yet optimistic, conclusion. PaidContent.org, an information company owned by Guardian Media Group, justifies the decision. The New York Times may be close to charging for online content. According to New York Magazine, the venerable “Gray Lady” is seriously considering a metered system that will allow consumers to read all of the paper’s content — up to a point. Once that limit is reached, the reader must pay for articles. This allows new visitors to explore the site while charging the heaviest users. Seems fair enough, right? The question is whether the Times’ audience will agree to pay or go elsewhere for their news. This is not the Times’ first effort to charge for content. In 2007, after a two-year foray into TimesSelect, a subscription service, Times management decided to offer its online content for free because they believed that the site’s massive readership — 20 million unique visitors — would bring in considerable revenue once online advertising techniques improved. Times executives hoped their strong online efforts would lead them to stand while other newspapers crumbled. 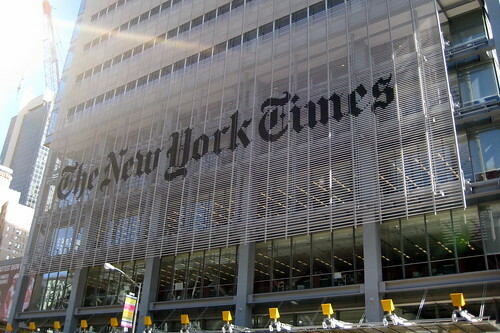 The proposed metering may mean big changes for people who rely on The New York Times. UW International Studies professor Tony Lucero requires students in his “Making of the 21st Century” course to read the Times every day. He said this will be a requirement regardless of the cost to access Times content, but he acknowledged that the Times is not the only option for reliable news. Subscription models typically work when a media brand offers content people can access nowhere else — such as small-town news — or produces content of extraordinary quality. People might pay for excellent foreign affairs coverage, but will they pay for the latest news about Conan? The New York Times may be overestimating what people are willing to spend money on — and competing news outlets with free services may benefit. The proposed metering raises additional questions. Journalist and blogger Jeff Jarvis tweeted a question posed by one of his followers: “I wonder if excellent NYT iPhone app will continue being free, bundled with subs, or metered?” Jarvis himself expressed dissatisfaction in a blog post by asking, “So why charge your best customers? Why single them out? Why risk driving them away?” Jarvis agrees with Clay Shirky that micropayments such as these are not the answer to saving journalism. The metering would not go into effect for several months, though a decision is expected any day now. What do you think? Would you pay to read The New York Times online? I would pay for the iPhone app of the NYT. But that’s not a subscription. GQ’s option to download an entire issue from the app store is an interesting experiment at the app store as newstand analogy, but I’m not sure it’d work for news journalism. Do You Pay for Your News? The Pay Wall KISS: Keep It Simple Stupid Can UGC be journalism? The Seattle Times has some doubts. Alms for the Press? The Case For Digital Subscriptions The Dark Side of Mobile: did Syria use mobile technology to target journalists?